When you've made the decision to study, it's important to do your research and ask course providers plenty of questions before enrolling in a course. That way, there are no surprises and you'll know exactly what to expect from your studies. 1. How long has your training organisation been in business? 2. Do you specialise in a particular industry? 3. Do your trainers/assessors currently work in the industry, or have relevant industry experience? 4. How do your trainers and assessors keep their knowledge current? 5. What are the levels of qualification you offer? 6. What are the job prospects like for the financial services industry? 7. How comprehensive are your assessments? 8. How will I get feedback on my assessments? 9. What do you offer in the way of student support and resources? 10. What software do you use for assessments? 11. Do you teach online accounting software? 12. Do your courses meet BAS agent registration requirements? 13. What textbooks do you use, and are these included? 14. Do you include any professional memberships? 15. How much face-to-face contact time is there? 16. What is the minimum time required to attend? 17. Can I speak to a trainer in person or is it all done through email? 18. What is the average time taken to complete the course? 19. What is the maximum time I can take? 20. Are there extensions or penalties if I don’t finish in time? Applied Education was established in 1999 by Brett Thornett CPA and Dan Logan BA(Ed). Both are still active trainers and assessors within the institution and take an active role in promoting the bookkeeping and accounting industry. Applied Education’s primary focus is in the bookkeeping and accounting industry. Whenever you speak to someone at our institution they will be familiar with the concepts and issues in this field. Along with working within the industry to maintain their knowledge, our staff undertake ongoing professional development including regularly attending events such as annual industry conferences (Xero, ICB), as well as internal presentations and training. Our nationally-recognised accounting training courses range from the Certificate III in Accounts Administration all the way through to the Advanced Diploma of Accounting. View the full list on our accounting and bookkeeping courses page. We also have a Business Faculty offering a range of business qualifications and short courses. Accounting and bookkeeping is one of the largest employment industries and typically posts stable jobs figures. Read further analysis of the industry in our article on the job outlook of the industry. We have been delivering most of our nationally-recognised courses since 2011, and have been offering industry leading training since 1999. This experience has enabled us to create in-depth assessments for our students. We use a combination of online tests and quizzes, written assignments and software-based assessments. 8. How will I obtain feedback on my assessments? Marking keys containing suggestions and feedback are uploaded directly to our online student platform, so you can access them at a time that is convenient for you. If you require further assistance, you are then able to contact the assessors through our online support ticket system, via phone, or by posting in our Facebook support groups or private student forums. Access your grades, recordings, class activities and all learning materials from your mobile device. Online student forum with hundreds of posts and responses - search your query and chances are someone has already asked the same thing! 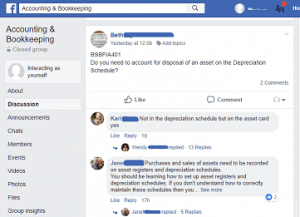 Private Facebook Group - Accounting & Bookkeeping - for our students only. Our members are typically very active with replies often posted within minutes! This will depend on the course you are studying. For example, our Certificate IV in Accounting and Bookkeeping uses a combination of MYOB and Xero, though some assessments can also be completed in any software of your choice. Our Australian Taxation Law course allows students to use the ATO stationery or their own practice software to complete tax returns. Yes – Applied Education is an Approved Xero Training Provider and we include Xero units in our Certificate IV in Accounting and Bookkeeping course. We also offer MYOB Essentials (Cloud) Online Learning depending on the course you enrol in. Yes, Applied Education is approved by the Tax Practitioners Board to provide BAS Agent courses, Tax Agent course and Tax Financial Advisers courses. We use a variety of texts from different publishers depending on the course. For most courses we provide PDF textbooks for free with the course, along with a range of extra learning materials to supplement the course content. Where PDF texts are provided, students also have the option to purchase hard copy textbooks for a small fee if required. Our more advanced accounting units and courses require the purchase of textbooks directly from the publisher. Applied Education students receive a discount on multiple-book orders. Our Certificate IV in Accounting and Bookkeeping, offered as Classroom Learning, requires 15 days in class – one day per week for 15 weeks. We don't mark attendance so if you happen to miss a class, or need to leave part way through one, that's ok. We understand you're busy which is why we have recordings of many of our classroom sessions that you can access online at any time, so you won't miss out. Yes, you can speak to a real person! We have a dedicated telephone support line and assessors on hand to answer your questions. We also have online forums and a Facebook support group where you can seek advice from your peers and other students studying the same units as you. This will depend on the course you are studying, as well as your ability as a student and the time you have available to commit to your studies. If you have prior experience or knowledge of certain topics this will allow you to complete the course sooner. For example, the Certificate IV in Accounting and Bookkeeping can be completed in as little as 6 to 9 months for someone with previous bookkeeping experience. Again, this will depend on the course you are studying. For a Certificate IV course you'll have 12 months to complete it, whereas with a full Advanced Diploma course you will have up to 36 months to complete the course. 20. What if I don't finish on time, are there any penalties? At Applied Education we offer a 3-month extension for all Certificate III, IV, Diploma and Advanced Diploma students at no cost, if required. Extensions beyond this will be assessed individually and additional fees may apply.